Zurich Medical, an innovator of cardiovascular devices founded in 2013, has for the past three years turned to the SciTechsperience Internship Program to hire interns. Several of those interns have been hired full time once they graduated, providing an important pipeline of talent for the medical device company. The Minneapolis team is hard at work conducting R&D for cardiovascular guide wires –a device used to navigate blood vessels and provide an easy access channel for larger catheters. Zurich’s guide wires have entered the pre-clinical testing phase, which means the SciTechsperience interns who work with Zurich have received in-depth experience in seeing how their medical devices are tested, analyzed and developed. 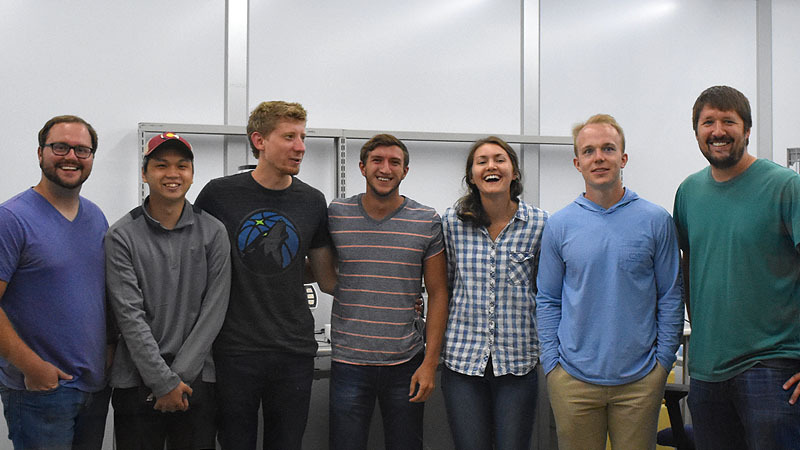 Ryan Kruchten, one of the engineering interns during the summer of 2018, pointed to his involvement with the device testing as the most memorable part of his internship. Kruchten is one of three SciTech interns hired by Zurich Medical this past summer. With him are Olivia Veloske and Carl Schoephoerster. Manufacturing Engineer Frances Chang, who helped mentor this season’s interns, has the benefit of teaching from experience. He started as a SciTech intern himself and said that the experience of going from student to teacher really helped him grow. “Explaining principles to our interns forces me to step back and realize how much I know now,” Chang said. All three interns are students at the University of Minnesota and are heading into their senior year. Ryan Kruchten and Carl Schoephoerster are both studying biomedical engineering. Olivia Veloske is majoring in bio-based product engineering. The 2018-2019 program year officially started the first week of September. Interested companies, employers and students curious to learn more about the SciTechsperience Internship Program can check out SciTechmn.org and apply online. There’s no fee, and applying is easy.